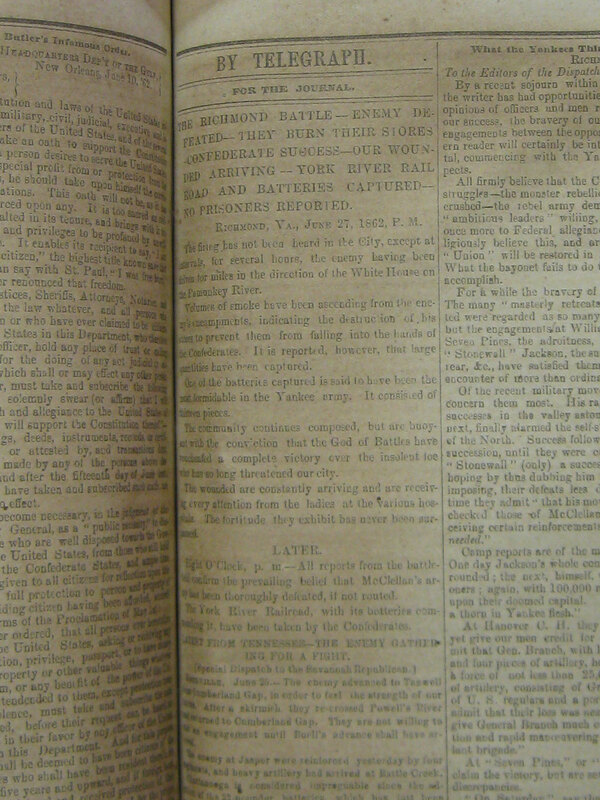 Item description: The Wilmington Daily Journal of 28 June 1862 included this report, received by telegraph, of military action around Richmond, Virginia. The article was published on the fourth day of the Seven Days Battles. Item citation: The Daily Journal. 28 June 1862. Wilmington, N.C.: Fulton & Price. C071 W74jd. North Carolina Collection, Wilson Library, University of North Carolina at Chapel Hill. This entry was posted in North Carolina Collection and tagged battle, newspapers, railroads, Richmond, Seven Days Battles, Virginia, Wilmington, Wilmington (N.C.) Daily Journal. Bookmark the permalink.